This might be a bug but it might just be an undocumented "feature". I'm asking because I want to know. Edit: This is now also filed as a bug. Edit: Here's a strace of gnome-panel. Upgraded to Natty from Maverick today with the intention of keeping my panel-based Gnome2 setup. I've already asked if that's possible and it does appear that's the case. My problem is on loading the panels, I get a ton of errors from very default applets like the Window list, Notification Area and Clock. Upon further investigation, I don't appear to be able to even add these types of applet. They're missing from the Add to Panel dialogue. Is there a package I need to install to get these applets back? Well this has been an adventure. I had seen this MintForum thread before but ignored it mainly because it was talking about bonobo (which is frankly a silly word) but also because the applet in discussion was the MintMenu. I decided to go back there today and actually read it. plumm's post has given me a few clues and has actually got a few things working (after some modification). Here's what I'm doing. Until I've got everything back this post is a work in progress. After a restart everything but GNOME_ClockApplet has loaded back up. More on this when I've fixed it. Well..there is a big issue here. Upgrading from maverick to natty is not going to be easy I must say! I have had the exact same issues as you are having . Try and follow these steps and see if it helps. Logout and login to the ubuntu classic session instead of unity. then logout and log back in. Now you will be able to see the gnome panels. Then you can add the existing applets If you cannot live without the ubuntu indicator applets try re-installing them. 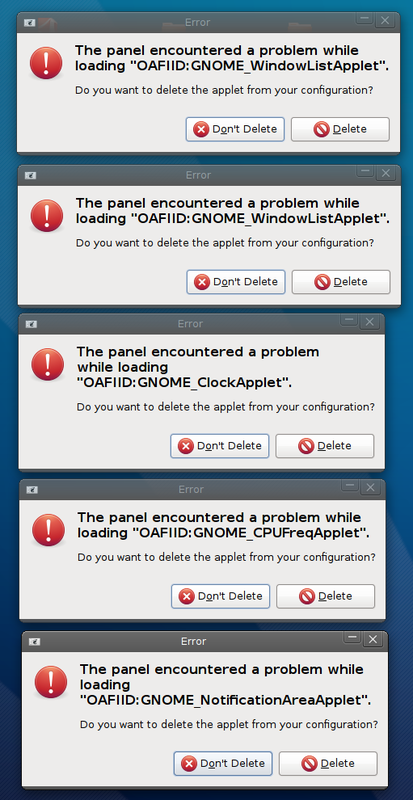 They have been causing errors for me in the gnome classic session. so i got rid of them. Right now, i have a situation where even unity is creating a lot of issues for me. i am thinking of installing gnome 3 and check how it fares. if everything fails i will have to do a clean install. Not the answer you're looking for? Browse other questions tagged 11.04 gnome-panel panel or ask your own question. How can I debug panel applets? Will upgrading to 11.04 destroy my current desktop settings? How to add panel applets to classic gnome panel? How do you turn on the customizable gnome-panel features (like gnome-applets) in Precise?